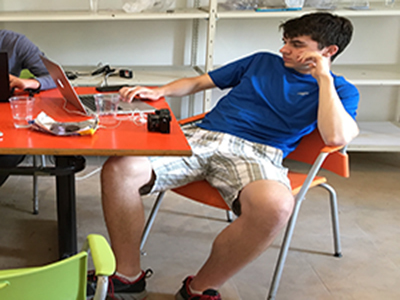 Today Keenan and Kalli work in the Photo Lab cataloguing and using the XRF machine. Laura digs and exploration trench in C South finding the floor of the Vault. Michae T. works in C North finding pottery and fresco. Podcast 6/13 " The Trench Fugees"
We're kicking off a new feature today. I asked Adam Savat, a rising senior at Brown to give me a list of songs he's been listening to in the field. Below are some tracks that Adam chose to share. On Monday, Eamon and I sat down at Obelix. We both graduated from Saint Anselm College this past May, Eamon with a degree in computer science. 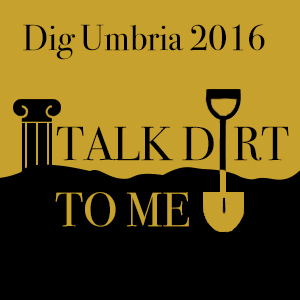 With a programming background he has been able to assit the dig in an important and I think surprising way. Today on the podcast we’re joined by Darlene, head of C North. She and Gina continue to move locus 646. Adam digs C South in the afternoon finishing a pass in locus 663, possibly finding another entrance to the vault. Kelsey helps Cally and Prof. Donais XRF (x-ray fluorescence) walls in the Cave. John helps Linda and Angela in the Lab. Taylor in Trench A removes locus 133 and finds a coin. Tina from C South begins a pickaxe pass in locus 663. Michael takes out a wall in the cave with Paolo and Kelsey. Keenan photographs a large brazier in the lab. Kristin from C Central takes down locus 662 finding a line of charcoal and a lot of tesserae. Erin in C North digs locus 646 finding a game piece. In Trench F, Kat takes away the top of locus 68. Kelsey and I first met the summer after our freshman year on the excavation. 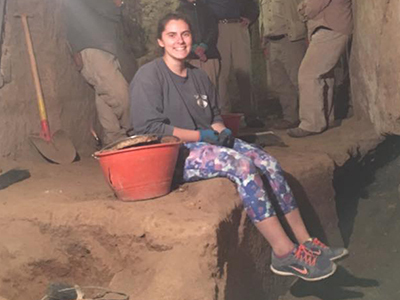 As a member of the excavation for all four years of her undergraduate career, Kelsey has spent more than six months studying archaeology in Italy. She’s worked in Cavita 254 for the past three seasons.